Despite being ‘at home’ much of the time, I’m finding there’s less time for elaborate cooking. The amount of ‘help’ a toddler affords in the kitchen is somewhat minimal. Add to that some late finishes at work for Andy and various cooking television programs that need to be watched and it means that dinner needs to be pretty much indestructible. Fortunately, winter is the season of ‘put on stove and forget’ and while we already have a decent stockpile of recipes it’s always good to try something new. 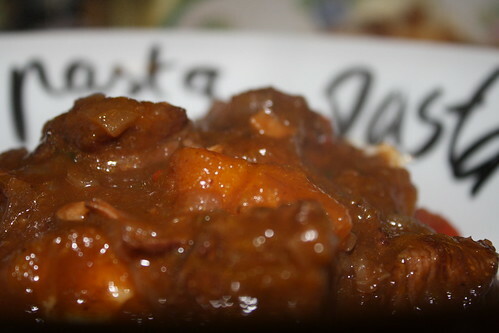 This beef stew recipe, from UK Delicious, fits the bill perfectly. It was almost a one pot effort and I’m sure that if you have a slow cooker you can adapt it easily. I also like it because I have this idea that you should always have at least three vegetables for dinner (not including potato) and this recipe has ALL THREE in the one pot. In fact, you could make it even healthier by adding a tin of tomatoes. We found that the only thing that needed flavour-wise was a solid hit of salt and pepper. On the side, a big pile of creamy mash finished off the dish, but I think pasta or polenta would work just as well. Of course, you could serve some extra veggies on the side. You could add them to the pot, but I think it’s much tastier to have the different textures and ‘clean’ vegetable flavours that you get by serving them separately. In theory this will serve six: you will need a lot of mash and sides if you are wanting to stretch it that far. A more conservative estimate is four. Because there are very few steps in this, it is absolutely toddler proof. I had all manner of interruptions while making it and you would never have known. Not quick, but very definitely easy! Heat some oil (I used canola) in a large casserole dish or pot and brown the steak. Do this in batches and set the meat aside. Add a little more oil if necessary and add the onion and garlic and cook to soften. Add the tomato paste and cook for a minute or so before adding the red wine. Allow this to bubble for a bit before adding the beef. Add the pumpkin, capsicum, thyme, vinegar, a good dash of Worcestershire sauce and the beef stock. Give it all a good stir and bring to a simmer. Reduce heat to low. Put the lid on and leave on the low heat for as long as you can. Prior to serving, adjust seasoning.